On the evening of the day the Marrickville Council was sacked, a design for a separated cycle path along a large section of Livingstone Rd was presented to Council's Traffic commitee. Most of the on-street carparking on that side of Livingstone Rd would have been removed as part of the project, but more than compensated for by creating additional parking spaces in side streets. (A net increase of 30 carparking spaces overall). Only 7 of the impacted residences did not have their own off street parking. Anyway, the design was knocked back by the Administrator due to a 200 strong petition in opposition to it due to the parking changes. 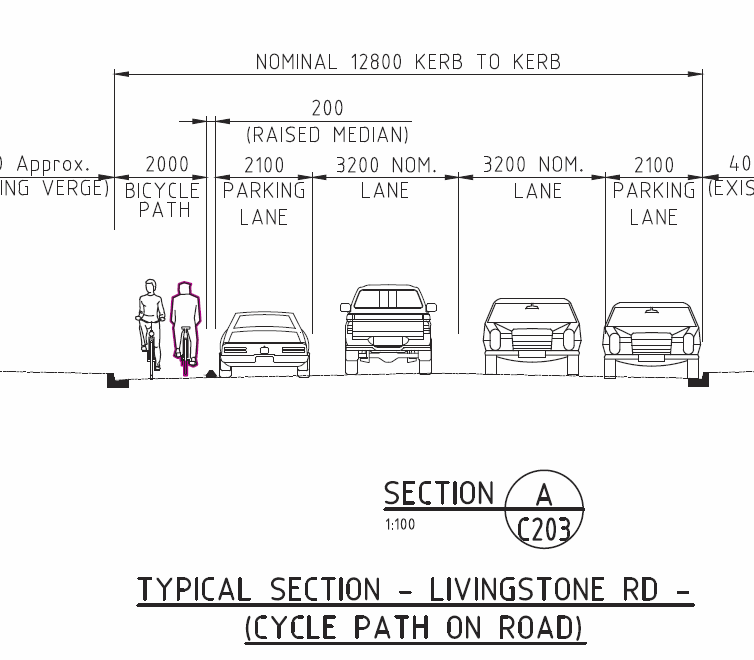 The revised design retains most of the parking on Livingstone Rd with a narrow (2m wide) two way path and a narrow concrete strip separating the cyclepath from the parked cars. In sections the path becomes shared path on the footpath. This is far from ideal but in the circumstances is better than nothing. This design will be brought for approval to the Inner West Council Ordinary Meeting 6.30 pm Tuesday 28 Feb 2017 at Ashfield Service Centre, 260 Liverpool Road, Ashfield. If you want to talk to the meeting, you need to register here. The Cyceway proposal is part of item 8 on the Agenda. Given the strong emphasis on safe, active, healthy community in the Community Strategic Plan that guides the council’s decision making, council has an obligation to represent these expressed community priorities, and provide strong and visionary leadership. 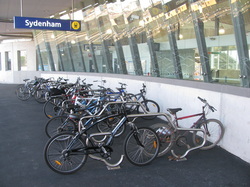 Sydenham Railway station is not a place you can comfortably cycle to at the moment, yet it is a transport hub with trains on southern and South-western line stopping there. And it has lifts! The recent station upgrade included the provision of large new bicycle racks but already they fill to overflowing on a typical day. Imagine how many people would ride there if separated cycleways were provided to the station. This is a real possibility as there is enough space on the roadway to the west of the station to incorporate separated cycle lanes. Bike Marrickville is urging Council to put some effort towards planning for high quality cycling routes to the station so that they can be incorporated into the next upgrade of the road which is long overdue.